The Utica Lacrosse Team traveled to Avondale for a hard fought game that found the Chieftains winning by one goal, 9-8. Great defense led the way with goalie Jason Cline notching 11 saves and helping out on the offensive end with the rare assist. Defenseman Ryan Fromm also had an assist from the other end of the field. On the offensive end, Maguire Palicke led all scorers with 5 goals, while Matt Mahoney (2), Howard McCollom (1) and Nate Montalbano (1) all found the back of the net. The team heads to Anchor Bay on Thursday to battle the Tars and the weather! This game is always scheduled early because their lacrosse field does not have lights. Timing will be tight on this one for those students riding in the Fromm bus. Anyone needing a ride needs to be in the van, ready to go at 3:50 in the Wiley parking lot. My school releases at 3:50 and I will walk out and we need to pull away before the buses. Ryan Fromm will be there and the van will be open for everyone to load their stuff and be ready to go. If you show up at 3:51, we will be gone! 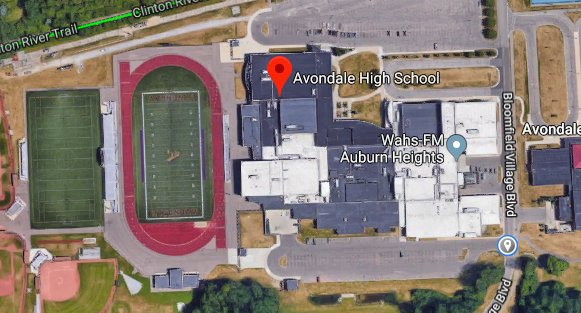 The Avondale athletic director passed along two notes: they will be charging an entrance fee at the gate and it is best to park and enter through the south entrance to the school. In the image below, you will want to enter where that white pin is in the bottom right corner. Drive in as far as possible and we will be playing on the field all the way to the left.